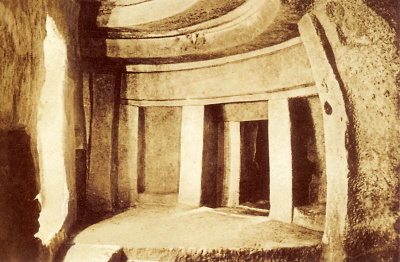 The Hal Saflieni Hypogeum is a subterranean structure testifying the artistic and architectural accomplishments of Malta's Neolithic society, spanning from around 4000BC to 2500BC. It was discovered during construction works in 1902. It was used both as a sanctuary and a cemetery. The bones of 7000 people have been found here (in bits and pieces). The monument is considered one of the essential prehistoric monuments in the world. Entrance is limited to 80 persons a day, and pre-booking a visit is usually necessary. One has to pre-book a visit to this site, as only 80 people are allowed inside daily. Also, photographing is forbidden, so I can't show more here than its entrance and the ticket. Is it worth all the fuss beforehand? Yes - beside being one of the highlights of Malta (together with Mdina, which still only is on the Tentative List), it's an unique construction dating from a very early age. Especially the "doors" are carefully carved out of stone, by a people that didn't have metal tools in use. There are a lot of mysteries surrounding the Hypogeum, adding some extra flavour to a visit. A trip here starts with a video that links this underground site with the many megalithic temples above ground elsewhere in Malta. I left the Hypogeum with mixed feelings. It is a really interesting place that shouldn’t be missed when in Malta and there is no doubt about its outstanding value. Parts of the underground temple gave me a fantastic picture on how the over ground megalithic temples must have looked like. The restriction to 10 people per group is reasonable. The audio guide is very helpful. As I usually travel on short notice, a reservation online was not an option (tour booked out until 27 October when I arrived 14 August). So I much appreciated they sell 20 tickets a day for the following day in Valletta’s Museum of Fine Arts. The museum opens at 9am. Better be quick if you want a ticket as the tours sell out soon. What caused the mix feelings were the entry fee (now 35 EUR when buying in Malta) and much more that I didn’t have a chance to take a picture. I had to hand over my real camera at the entrance and my cell phone camera was not good enough for an illegal picture of the dimmed lighted areas. Further, the temple itself is quite small and not one bone or artefact was left inside. The place was not difficult to find. It’s signposted and you’ll get a map from the museum. There are parking lots close to the nearby church. Further, the Tarxien Temples, which belong to the Megalithic Temples of Malta WHS are within short walking distance, which gives you the opportunity to visit another WHS while waiting until the tour to this WHS begins. We booked our tickets to see the hypogeum in January for a July tour. Only 60 people are allowed a day in groups of 10. The tour starts with a general overview of how it was found. There is a small replica of the Sleeping Lady that visitors can touch. After this, visitors watch a short film regarding the history of the site. From here, visitors tour the hypogeum, which at this point is roughly 45 minutes in length. It is very dark and wet, so one should have proper footwear to accommodate such conditions. The tours are with audio whisper devices, with a tour guide giving enhanced information and answering questions. No photos are allowed. I thoroughly enjoyed this trip, and hope to see the Tarxien Temples next time. I have visited this unique WHS several times. It is my favourite WHS in Malta and it is also considered to be the only underground neolithic temple in the world. 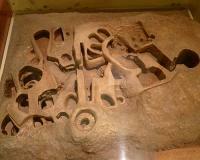 It has only been discovered early in the 20th century and it is pretty much intact. Several archaeological remains have been placed in the National Museum of Archaeology to help preserve them better. The highlight of this site for me is the incredible acoustic effect that can be achieved in the main chamber, 3 storeys underground. A must-see in Malta but you have to book ahead online to be able to visit. Hal Saflieni is an archaeological site of world significance whose “visit experience”, put in place as part of a major conservation project lasting some 10 years which ended in 2000, is worthy of it. If you are visiting Malta you should book ahead to ensure that you are one of those very few people allowed in each day! The site consists of a series of underground burial chambers cut into the living rock through 3 levels to a depth of some 11m below street level in the suburb of Paola which is 20 minutes by bus from the Valletta terminal. You enter through what looks like just another terraced house in a side street to find that you are in a visitor centre built over the entire excavated site after 4 such houses had been demolished. The low key street frontage has been maintained, giving no impression of what lies within and below. Each hourly tour allows a maximum of 10 visitors (and our experience was that even this is perhaps 2 too many!!). 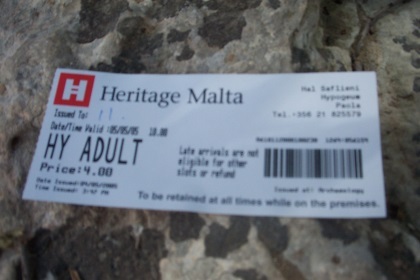 Look on the Heritage Malta Web site for up to date details and to book. Most of our group had booked as early as January for a tour in late April. A notice on the door indicated that the next 2 day’s tours were full – and, as I look again on May 2, the entire month is “full”! However, elsewhere there was reference to a procedure by which the first and last tours each day were for late booking either at the site or at the Valletta Archaeological Museum – but with no age/student etc discounts from the 25 Euro standard charge. Worth investigating if you haven’t pre-booked. The tour lasts 1 hour and is operated via a multi language audio hand set for each visitor which automatically provides information relevant to each location, together with creative sound effects and music which some might find annoying but which I thought added to the experience. A human guide looks after health and safety (the tour takes place in often near darkness down steps in a very confined space and under some low hanging rock!) and generally moves things along. There are 3 parts to the tour once you enter from the small vestibule which issues/checks tickets and sells guide books etc. First, an exhibition area in Maltese and English explaining the site and its place in World and Maltese archaeology (also covered by the audio system). It has internal dark glass walls which look down on the highest level of the site – preserving it from the long term effects of light which has been a major objective of the conservation project and explains also the general darkness of the tour and the fact that even the very low level lighting is only switched on automatically for a few seconds whilst visitors are actually present at a viewing point. No cameras are allowed and they have to be checked in at the vestibule. The small numbers allowed in reflects the sheer physical limitations of the site and also reduces the possibility of breath-induced dampness. The second part consists of an AV presentation in a small theatre area – it covers much of the same material as the exhibition but in more detail and was quite well done I felt. Finally (I guess after around 20-25 minutes so far?) the tour descends a 1 metre wide metal walkway with handrails down slopes and steps in an approximately circular route emerging some 9 “stops” later up a circular stairway. There is hardly room for 10 people to see all the points which are illuminated in turn at each stop in synch with the audio and there has to be a fair bit of give and take as 10 people squash and turn together to see the chambers highlighted on each side! An interesting issue concerns historic “period” of the site. The 1980 AB evaluation (There is no Nomination File on the UNESCO site) states “This unique monument dates back to early antiquity (about 2,500 B.C. ); it is the only known example of a subterranean structure of the Bronze Age.” This initial assignment to the “Bronze Age” has gone viral and is replicated on numerous Web pages including those of UNESCO and (currently!) that of this site! From visiting the site and the Valletta Archaeological Museum (An essential call if you are visiting Maltese archaeological sites! My photo of the site model is from there), as well as reading the technical brochure available on site and numerous Web articles, my understanding is that the site is most definitely NOT “Bronze age”!! It is Neolithic and dates from around 4000 to 2500BC. Its main construction was preceded by Ggantija and succeeded by Tarxian – but overlapping with both. The transition from Neolithic to Bronze age is a topic of some debate within Maltese Archaeology. The Bronze Age certainly started later there than elsewhere. The first Bronze Age site in Malta is Tarxien Cemetery (just down the road from Hal Saflieni) dating to 2500BC and the main one is Borg in-Nadur which represents a later phase from 1500BC. One theory is that their peoples came from Sicily, possibly in 2 waves. Tarxien however is primarily a Stone Age temple site and the Bronze age remains are solely those of cremation rituals (completely different from those the Temple was created for) by people re-using the area – hence the naming of the site as “Tarxian Cemetery” as opposed to “Tarxien Temples”. A few Bronze Age remains have been found at Hal Saflieni too and the exact nature of any use of the temple during the transition period isn’t understood but it is essentially a Neolithic site created using Neolithic technology and supporting Neolithic beliefs and rituals. During my researching I referenced the AB evaluation for Neolithic Ggantija and was amazed to discover this – “the “Ggantija period” (ca. 3000 to ca. 2200 B.C.) 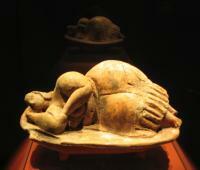 is one of the most important periods of the Maltese bronze age”. This was stated in the original 1980 evaluation and carried forward to the 1992 version for the additions! Whoever was involved in these nominations back in 1979 seems to have been obsessed with the “Bronze Age”! Another question concerns why the site is inscribed separately from the “Megalithic Temples” which were also first inscribed in 1980. Ok, so it is primarily an underground temple whilst the other 7 are all above ground but they all represent the same culture/period (Indeed one of the important aspects of the “underground” carving of Hal Saflieni is that it shows what the interior of an above-ground temple roof looked like). The answer seems to lie in the fact that the Temples were originally inscribed solely as “The Temples of Ggantija”. Malta was following a policy of 1 location = 1 nomination. ICOMOS actually commented that Ggantija inscription would “exclude. … the inclusion of later proposals concerning the analogous sites of Tarxien, Hagar Qim. And Mnajdra”. Their addition in 1992 overturned that decision but left Hal Saflieni rather strangely separate from the other sites of its period! Malta obviously didn’t feel like “losing” a site by incorporating it into a combined “Neolithic monuments of Malta”! I visited around the year 2000 when my travelling companion discovered the site. We were fortunate to get tickets as a walk in but had to wait several hours for our "group". i am so glad i saw it and no visit to Malta would be complete without feasting ones eyes on this quite amazing place. Awesome is one word, etheral even. One could well imagine harbouring visions of past residents lurking somewhere in the background. The detail in the carvings, the knowledge that went in to the construction. Mans ingenuity never ceases to amaze. I commend this place as a "must see" to use an oft used cliche. But this place really does qualify. I suspect any person, religious or not, will be moved by the experience. The Hypogeum is tucked away on a fairly unremarkable street in the suburbs of Valletta. From the outside it looks just like another house, however what lies below is very impressive and reputed to be the only subterranean prehistoric temple ever discovered. The Hypogeum is set out over three levels, the oldest being the top level. The second level is the most interesting with many chambers. Some of the ceilings are decorated with red ochre designs; there are many other rooms with lovely details and even marks on the walls showing how the caves were dug out, similar to the Flint mines at Spiennes. The Holy of Holies is the most famous part of the whole complex, and is very impressive; the architectural details are carved into the living rock, and give the only indication of what the ceilings of the many temples of Malta. It was on this level that the famous statue of the Sleeping Lady was found. I found out later that there are several mysteries associated with the Hypogeum, one of them regards the finding of a secret chamber with a ‘bottomless’ pit sounding eerily like Mark Z. Danielewski’s House of Leaves. As stated above entrance is very restricted, only 80 people a day can get in, and when we visited there were no tickets available for the next 10 days. A few people were waiting for last minute cancellations, however they were not having any luck from the looks of it. I enjoyed my visit, and the introductory video was a great start to exploring the Megalithic sites in Malta and is such a unique and important site that there is no questioning of its place on the World Heritage list. I was lucky enough to visit in Nov 2003. You must make reservations at least 1 month in advance. Only 45 or so people get to go in per day in groups of 12-15. The Hypogeum is a massive underground series of carved out caverns that contained the remains of more than 7,000 humans. Some red faded rock painting remains. Recent research indicates that this site could be as much as 12,000 years old. The film and informative tour guides insure a thorough understanding of the site but no photos are allowed. They lock up your cameras! Not recommended for claustrophobiacs. The site is a 30 minute bus ride from Valletta. Be sure to visit the archaeological museum in Valletta to round out the experience. Guided Tour Only: "To ensure its conservation, the site's microclimate is strictly regulated. For this reason, the site is open to a maximum of 80 visitors each day....From Monday to Sunday eight tours will be conducted, starting on the hour from 9.00 till 16.00 (last tour). There are two special tours at noon and 16.00 hours. To plan your sightseeing, we advise that you book ahead as tours are often full up to weeks in advance. For your convenience, you can use our new online booking.... Tickets for the Hypogeum are also available in person from all Heritage Malta sites." Visitor Limits: "Following consultation with UNESCO a limit of 80 admissions per day has been set, and this in order to prevent irreparable damage to such a sensitive and unique site. Heritage Malta cannot and will not go beyond this limit"
164 Community Members have visited.